PA PM Fayyad met in Jerusalem with US Secy of State Clinton, but said nothing new: no talks with Israel without concessions first. 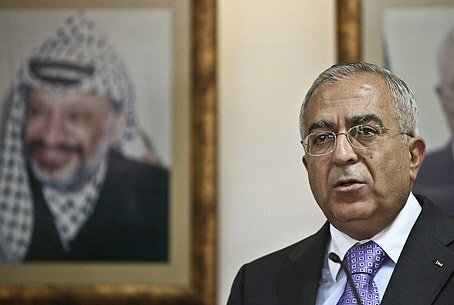 Palestinian Authority Prime Minister Salam Fayyad met in Jerusalem with U.S. Secretary of State Hillary Clinton on Monday before she boarded a plane, but his message was the same: no talks with Israel without preconditions. The meeting, held at the U.S. Consulate in eastern Jerusalem in the Arnona neighborhood, ended as have all the others, with Fayyad demanding Israel make concessions before the PA agrees to sit down for final status talks. Abbas aide Nimir Hamad told the Bethlehem-based Ma'an news agency the meeting was a follow-up to Clinton's meeting with PA Chairman Mahmoud Abbas in Paris nearly two weeks ago. Clinton agreed to convey to Israel demands by Abbas that Israel free Arab prisoners incarcerated prior to the 1993 Oslo Accords, and allow the transfer of new weapons to the PA as a precondition for negotiations. Nevertheless, with a national election in full swing stateside, it is likely that Clinton has little time to spare for an entity that is unwilling to compromise in any quarter and offers few votes to compensate for its stance. Nor is it likely that she has any further desire to prod Arab leaders who so clearly themselves are not motivated towards peace. During U.S. President Barack Obama's first term, and following his “Cairo address,” four major secular Arab regimes (Tunisia, Egypt, Libya and Yemen) were torn down. In all four countries, the Muslim Brotherhood rose up and took a major role in the governments, all of which became Islamist. In Libya and Yemen, the international Al Qaeda terrorist organization has expanded its operations and control over territory in both countries as well. Among the leaders deposed was former Egyptian President Hosni Mubarak, who managed to maintain a 32-year peace treaty with Israel. Mubarak's successor, Muslim Brotherhood President-elect Mohamed Mursi, will face a major challenge satisfying his backers' thirst for conquering Jerusalem, while finding a way to mollify the United States' insistence of maintaining the peace with Israel, or risk losing desperately needed foreign aid. Meanwhile, Syria, Israel's neighbor to the north, is also engaged in a savage civil war that appears likely to end with the removal of President Bashar al-Assad, while rumors are drifting across the border that Al Qaeda has infiltrated that country as well.